A new study by Climate-KIC shows how towns and cities can chart a path for a successful transition to a low carbon economy. 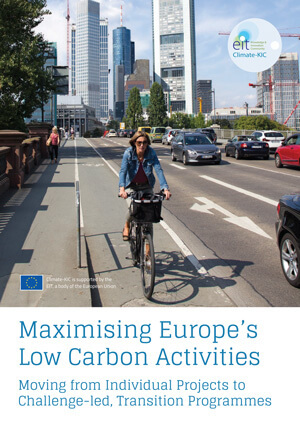 The report, ‘Maximising Europe’s Low Carbon Activities: Moving from Individual Projects to Challenge-led Programmes’ (PDF download) assesses programmes where public authorities have recognised the limitations of a traditional project approach, and moved towards more comprehensive programmes. Europe has set tough targets to cut its greenhouse gas emissions by 20 percent by 2020, with even tougher targets to achieve in 2030 and 2050. “There is appetite to meet the challenge at grassroots, but initiatives are often isolated and fragmented, limiting their overall impact. As such, the whole of this low carbon endeavour amounts to far less than the sum of its parts,” explains study author Dr. Jon Bloomfield. The report is drawn from the Transition Cities project, part of a range of Climate-KIC programmes designed to help cities reduce greenhouse gas emissions and create new jobs for their low carbon economies. Firstly, that cities should consider three crucial ‘end uses’ – buildings, energy networks and transport – and seek to develop low carbon clusters in these areas. This dovetails with European Commission thinking, which shows an increasing interest in approaching climate challenges with systemic solutions. Secondly, it studies six cases of wide-ranging, broad initiatives that cities and regions have already taken to tackle big climate change issues and how successful these have been in achieving high impact. An example detailed in the report is of Frankfurt, where the city has set up an Energy Agency to increase the capacity of Combined Heat and Power (CHP). This approach led to the expansion of installed CHP from just 150 kilowatts in 1990, to just under 5 megawatts today. The Agency acts as an enabler by engaging stakeholders, conducting feasibility studies and providing technical expertise. Bloomfield, who works in Climate-KIC’s West Midlands regional centre in the UK, argues that the report’s findings should be used to influence the activities of the new 2014-2020 European Structural Investment Fund programmes, which have sizable allocations for low carbon initiatives. “The focus on a clear challenge helps to build a critical mass of activity and avoid the dangers of piecemeal fragmentation and isolated, stand-alone projects that have little wider impact,” he explains. Dr. Jackie Homan, Head of Sustainability at Birmingham City Council, the project lead, agrees that a ‘pepper-pot’ approach, with low carbon projects being scattered across Europe’s cities and regions, is a real danger. “European Regional Policy needs to minimise this risk,” she says. “It should encourage a challenge-led, transition approach as a model to be followed across its structural fund programmes. A targeted approach focusing on key challenges would concentrate resources and help European low carbon activity to increase its impact,” she adds. With the initial assessment complete, the project is looking to expand the group of cities engaged through the project. This will enable a larger group of cities to benefit from the challenge-led approach of tackling climate change issues. Climate-KIC’s city initiatives work at the heart of Europe’s low carbon regional development agenda targeting climate impact, social and economic benefit, and reach out to cities around the world. The organisation is set to launch a new global programme at the ICLEI World Congress in Seoul, South Korea, on 8 April 2015. Climate-KIC’s Low Carbon City Lab programme brings together city administrators and networks, businesses and research centres and aims to enable cities to roll out now low carbon strategies and innovations. By scaling up its uniquely integrated innovation model and investing in an ambitious range of challenge-led or demand driven demonstrator programmes, Climate-KIC is leading the way in helping our cities chart a path to successful low carbon transition. You can download a PDF copy of the study.